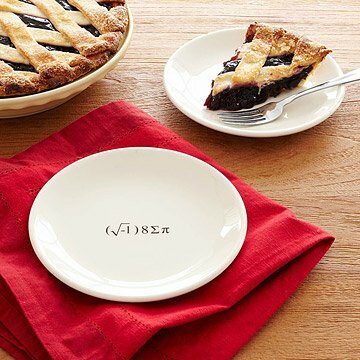 Indulge your inner geek and sweet tooth with this witty plate, featuring a math equation message. Celebrate your inner geek while satisfying your sweet tooth with these brainy "pi" plates. Translating to "I ate some pie," the witty equation on this mathematical tableware adds a wry side of genius to a morning frittata or midnight snack. It's a delicious equation for your favorite number cruncher or head of the class. Sold as a set of 2. Check out the matching "i eight sum pi" dish here! It was just a little gag gift to accompany a Birthday Cake. "i 8 = pi" looked beautiful and seemed sturdy. My research group purchased this for our advisor's birthday. They match a pie plate that we got for him last year. Purchased two sets: One set for my daughter and son-in-law's 1st anniversary; they were married 3-14-15, Pi Day. They loved them! The second set is for my other daughter and son-in-law's upcoming anniversary; my daughter teaches math and my son-in-law is clever, so I know they will get a kick out of these plates too. Very creative design, and it's very sleek as well. I was real happy with the purchase, even though it felt a bit costly for just 2 dishes. The couple I bought these plates for love each other and pie -- She bakes a lot of pie and he eats it! It seemed like the perfect gift for intellectual, talented, imaginative and creative people. They had just re-done their kitchen and this was a kitchen renovation-warming gift. They just love the plates! I got this for my father-in-law who taught science to high school students. His girlfriend is a professional baker, this gift was perfect it suited both of their interests. The scientist (without reading the box) understood the equation right away! My Uncle is a Physics Professor and my Aunt is a Chemist. It is nearly impossible for me to find a gift that they would actually want/need... until I saw these! I wrapped them separately and had each of them open the plates at the first time to see who could guess the equation first. The real winner... ME for giving them a gift they will use a lot and providing lots of laughs as well. Thanks for such a great quality item.